Le Curvy Kitten: Fitting Faux Pas and Bikini Bloopers! There is a rather infamous battle of bra fitting that has constantly been raging for quite a few years now, so I thought I'd give it a quick mention, as it is linked to the bikini half of my blog. The old school method is to add 4-5 inches to the actualy underbust measurement, which I'm sure is where all this 'blah blah % of all women are wearing the wrong bra size' thing comes from. I've only recently (in the past 3 months maybe) discovered that instead of the 32G I was wearing, my 'real' size is 30G. 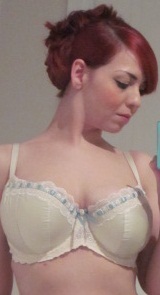 It was clear from my Star In A Bra entry photos (32G) that I was wearing the wrong size, even a MAN commented on this! Surely this is proof enough that the old method is wrong?! Here's a photo of me wearing a 32 back size.Not the best picture to demonstrate this, but you just about see that the bra sits away from my chest at the gore (the centre of the bra, between the cups). This means that all the support comes from the straps, causing pain, red marks and cutting in on the shoulder muscles. So, according to some online calculators I come up as anything from a 32E to a 34E, and many sizes besides. With this in mind, I decided to try on a few bikinis from New Look's range by Kelly Brook. Firstly, a very cute black and white gingham number in a 32E. I don't really need to say much about this, I think the photos say it all...The only plus side is that the cups are big enough. Stringy straps=ouch! Next I tried a 34E swimsuit. Unflattering, badly fitting. I am NOT a 34! Maybe if I tied the 'bra strap' back instead of using the fastener....? Lastly, I adore the fabric and ruffles on this last one, again a 34E. Cups on the large side, same with the back. I like your blog! It's nice to see a girl actually trying on the bra's so we can get a good idea of how they all fit. I agree with these Kelly Brook designs - so disappointing. She has some lovely pieces, but like you say, the straps are the most unsupportive things in the world and i find they all run too big! I think you are the same as me with the small measurement from your shoulders to your breasts. I have a constant struggle trying to find bra's that go short enough on the straps to provide adequate uplift. Any suggestions on brands would be great! Thanks again for a great blog - i will be coming back to this!